Less is more. 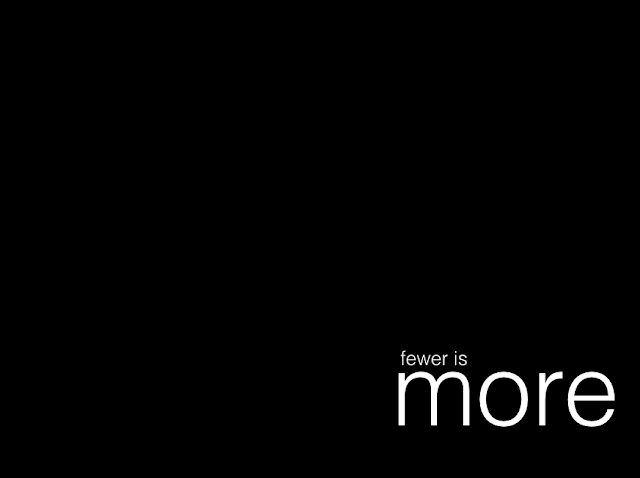 Or fewer, in fact. p cubed presentations > Latest posts > #FOAMed > Less is more. Or fewer, in fact. Less is more in design. The same applies to the number of slides in p2; except for the grammar. Restraint increases effect in decoration and so it is with slides. Slides decorate or support the story and its delivery. Fewer is more. Once the storyboard of p1 has been constructed, it is important to remember that not every single step in the process requires to be illustrated. This often harks back to the need to annotate each point and probably also reflects the use by many presenters of visual prompts within the p2. Each slide should be essential, never superfluous. Restraint in number of slides is as essential as in their design.